Why is Mourinho having a go at Mhkitaryan? 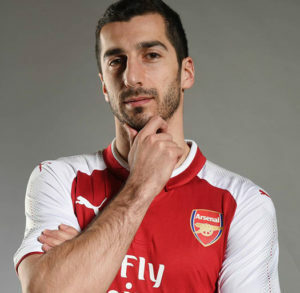 Arsenal sold Alexis Sanchez to Manchester United in January and the Armenian international Henrik Mhkitaryan came to the Emirates as his replacement, and Jose Mourinho for some reason has now chosen to announce the reason for him letting the talented wide man join the Gunners. When asked if it is hard to keep players in the side when they are not starting, Mourinho said: “It is not hard, it is impossible. “It depends on the nature of the player. “The way Myhki [Mkhitaryan] dealt with it, is different to other players. “He realized he was not ready for this reality – physical, mental, competitiveness. It is true that Henrik has missed quite a few games through injury since joining us, but when he has played he has seemed alert, talented and intelligent. Is Mourinho just being spiteful? This entry was posted in Arsenal News, Arsenal NewsNow on June 4, 2018 by Admin. He is pissed because he scored against them. I hope you are right Phil. But, who got the better deal out of the swap will be decided in the coming season. Hope that is us. But we all know what Alexis is capable of. Why are we discussing what Mourinho thinks? I would rather discuss what Trump thinks. And I would rather eat poisoned worms than discuss what Trump thinks. Well Mourinho is gonna blame the players, of course he would it’s Mourinho. De Bruyne Salah Mkhitaryan he’ll have excuses for them all and him being the problem will not enter that mans ego. He’s a narcissist, of course it’s about his demands being hard for some to reach rather than himself not knowing how to get attacking players play at their creative best and still win. Lets not only look at the negatives only because of the person delivering this message. At his age and with his stamina I tend to agree abit with Jose here (bitter taste in my mouth), Mhki’s recovery might not be the best as evident from his knocks. Solution to this, get another winger (explosive winger preferably) or someone who can paly as a 10 / winger so that Mkhi can rotate with him plus Ozil who seems to have similar issues lately. Play Mhki / or Ozil for 60 mins or so in most games. Zidane was heavily praised on how he kept players like CR7 and Modrich fresh for the later tougher periods of the season by having proper player management and a good squad. The EPL is a very physically demanding league, not all players are fully fitted or clever enough for it, enough our magicians in Santi and TR7 couldn’t cleverly manoeuvre it. He is under pressure from a large majority of Man Utd fans who consider Sanchez to be a complete waste of money in terms of his wages. Mourinho is trying to deflect the pressure of the fans by pointing out the weaknesses of Mhki a player he signed.He is falling on his own sword and long may be continue to do so.He is the most egotistical ,arrogant Manager in football.As far as i am concerned Arsenal have come out of the swap deal on the right side. You signed the player knowing all the issues he had, then after selling the player you complain about the issues he has to hide the fact that the deal you did has not work out the way you want it. Good forinsic analysis of Sanchez and Mourinho’s mien for greed in trying to have all potential stars to his team always but abjectly lacking in making any a star. A schadenfreud attitude towards other managers. Verratti’s not a box to box player. If he was we’d be talking Ramsey type numbers or more, he has two assists and two goals which is similar to defender’s type numbers. He has 3.3 tackles per CL games, anyone who follows stats will know which central midfield player hits those type of numbers, Ramsey is usually 1.2 to 1.5 or 6, it fluctuates with injury or form. He’s (MV) had injuries this season missed some fair game time but pulled in 2.6 tackles on average, and this is for a team who control the ball in almost every fixture. You put him in a Bolton a Leic or a Stoke, we’re looking at, 6, 7, point something tackles per game. He is great at wriggling out of tight situations and starting off attacks, this does not make him a box to box, it makes him a highly capable ball player. When a team parks the bus, even defenders must lose some shackles, being an Arsenal fan you will already know that. Verratti is best at sniffing out danger before showing a commitment like only the best can, he’s fearless. So “The Special One” claims, “He realized he was not ready for this reality – physical, mental, competitiveness”. WTF Mourinho?, you’re so full of s**t! Mourinho’s reality is so much different to everyone else’s. He’s lost his “touch” to the likes of Klopp, Poch and Pep etc. and is no longer that special. Even he can’t get the best out of his players and blames them with not living in “reality” ! LOL, just LOL Mourinho..
Two excellent posts I have just read. Grandad, you sum up exactly what Maureen is and why he would never be appointed as an Arsenal manager. Plus the fact he always looks grubby!!!!! Phil, we did play to Sanchez’s strengths, but to the detriment of the team. Your point about Maureen being defensive is correct, but that was also our weakness. Both Sanchez and Ozil, world class players, should not have been allowed to shirk their defensive duties and that is where Sanchez is in trouble at Its in my opinion. I just hope that we sign the players that allow Ozil to play the same role as he does for Germany. Didn’t miki say first that he loved the free flowing attacking football of arsenal versus his last club and mous style? If he did then that would be enough to ruffle the ego maniac into going on record……again! Can’t stick mo must admit I’m going off klopp finding him a bit ott for my own liking with fake staged smiles and crazy pumping I like a bit of that but come on! What does jM know anyway, @chelsea de bruyne sold, Salah sold, arjen robben sold and so…….